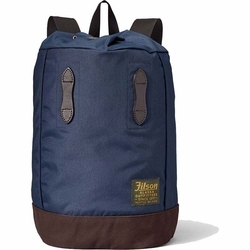 Filson Small Pack. This small daypack is ideal for hikes and quick trips. It's made with lightweight, tear-resistant matte nylon. The structured base is reinforced with Filson's signature water-repellent Rugged Twill. It has Filson's signature Bridle Leather tabs on the front. A padded back panel and webbing shoulder straps keep this grab-and-go bag comfortable, while the cinch-top closure and removable interior wool zipper pouch secure goods.